Note: This is part of a four-part recipe series, the Search for Enjococado. It was a hard road we went down, but there were things that seemed right from each of the enjococados I tried. 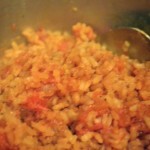 The first recipe was too red and too spicy, but the flavors seemed close, especially the added cinnamon and cumin. The second recipe had hardly any spice at all and was way too heavy on the nuts. It tasted rather… nutty. But the nuttiness is something that I knew needed to be a part of any perfect enjococado. And the oranges helped give a slight citrus flavor which complemented the rest of the sauce. The last recipe seemed to get the chile proportions right, but was clearly missing a number of important flavors. And so, I combined these recipes to form what I think is as close as you can get to a perfect, La Fiesta-style – and Fiesta del Mar-style and La Fiesta Too-style – enjococado. Give it a try and experience Grandma’s Special at home. Salt both sides of the chicken breast as much as possible. Allow chicken to rest. 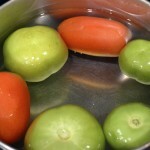 Place tomatillos and tomatoes in a medium pot with water and allow to come to a boil. Remove from heat and add chiles (all of them), then cover and let stand for at least 15 minutes. 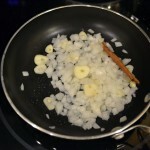 Meanwhile, sauté 1 tsp oil, garlic, yellow onion, green onion, cinnamon, and cumin over medium heat until the onions soften soft, then add the slivered almonds and cook for another 5-10 minutes. Do not allow the onions or garlic to brown much, if at all. Remove from heat. In a large pot or Dutch oven, heat 2 tbsp oil over medium heat and cook the chicken slightly (shouldn’t be fully cooked), no more than five minutes. Remove from pot and turn heat off. 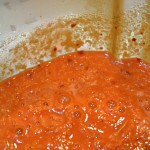 Drain the tomato/tomatillo/chile mixture, reserving liquid and place into a blender. Add 1 cup of the reserved liquid. 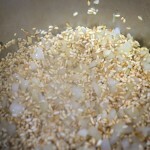 Add the onion mixture to the blender and blend until smooth. There’s no such thing as overblending here, so feel free to continue to blend. I personally like to see small pieces of chiles in the final product, but you may not. When blended, add mixture to pot (or Dutch oven) and turn heat to medium-low. It’s important to do this when the pot is still warm. Stir well, scraping any chicken pieces off the bottom of the pot. Add chicken to the mixture and cook for 15 minutes, stirring occasionally. Add the Mexican cream and allow to cook for an additional 10 minutes over low heat until the cream is fully absorbed and the mixture is warm. 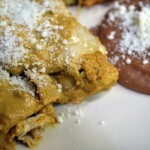 Serve with Mexican rice and beans as well as tortillas. This final recipe I found is fairly close to the required spiciness, but misses the mark in a lot of different ways. For example, it doesn’t involve cooking the chicken inside the enjococado, but rather boiling the chicken and putting the enjococado on top. I know for sure that’s not how it should be done. So I modified the directions a bit to be more in line with what the other enjococados called for. That resulted in an incredibly oily dish that had the right spice, but was missing the nutty flavor that’s needed. 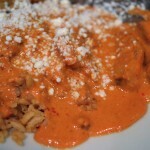 It also called for far too much Mexican cream – in the case of this recipe, it actually called for sour cream, which was weird. Anyway, here’s a much simpler recipe to try that’s close in spiciness to what enjococado should be, but lacking in a bunch of other ways. Soak peppers for about 20 minutes in hot water, then drain, reserving 1 cup of liquid. Meanwhile, heat oil over medium heat in a medium pot (or Dutch oven) and salt the chicken excessively. Cook the chicken in the pot until about half cooked, then remove from pot. 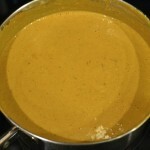 Place peppers, garlic, chicken broth, cumin, and reserved liquid in blender and blend until smooth, but thick. Pour pepper mixture into the pot where you cooked the chicken and cook over medium-low heat for about 10 minutes. Be sure to scrape the bottom of the pot to get any chicken bits that might be stuck to the bottom. Add the chicken to the mixture and cook for about five minutes. Add the Mexican cream to the mixture and stir well, cooking for an additional 5-10 minutes or until the entire mixture starts bubbling to ensure it’s warm. I’m not the only one who’s looking for the recipe to a delicious enjococado. A Google Answers thread outlines a recipe that was found on a website, years and years ago. I looked around for someone who had tried it before and followed as close as I could, changing a few things based on my experience with the previous enjococado recipe. The flavor definitely came out nutty and wasn’t really spicy at all. However, there was something special from it and I appreciated the nuts in it somewhat, but they were too overpowering. This version also came out far too thick and chunky. Perhaps more water would help, or maybe more reserved liquid. Feel free to give that a try. Of course, the entire recipe as found didn’t seem to follow the process that all other recipes followed (like blending!). That didn’t make sense to me, so I made the recipe my own. In my case, I made enchiladas instead of traditional enjococado. 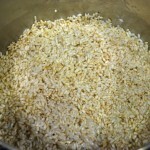 Fill a small pot with water and boil on high heat. Turn the heat off and place the chiles inside, covering. Let stand for 15 minutes. Heat 3 tbsp olive oil in a large pot (or Dutch oven) over medium heat. Place chicken breasts oil and cook until about half done, taking chicken out of pot when it’s ready. 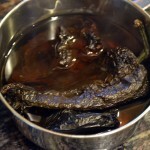 Drain chiles from the pot, reserving 1 cup of liquid. Chop chiles into large pieces. 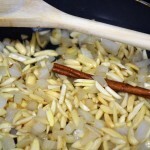 Heat 3 tbsp olive oil in a medium skillet and fry the garlic, onions, almonds and chiles for about 10 minutes. Place mixture from skillet into blender, along with the reserved liquid from earlier. Add orange juice and zest to blender and blend until mixture becomes very fine. Pour mixture from blender into the large pot that the chicken was cooked in and cook on medium-low heat for five minutes. Be sure to scrape the bottom of the pot with your spoon to remove any chicken pieces. Add chicken back to pot and cook for an additional ten minutes. 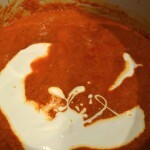 Add Mexican cream to the pot, stirring well, and cook for ten minutes. Add salt as needed. I found this recipe from some googling and it was the first I made, mostly because it seemed like the closest. 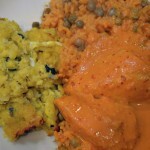 The flavors are quite wonderful and I was impressed, but something wasn’t quite right. It was clear to me that this recipe was some kind of enjococado, but not the kind I was looking for and definitely not the infamous one found at La Fiesta. It was also a bit too dark – too red – in color, something not hard to control, but I didn’t want to experiment too much the first time around. 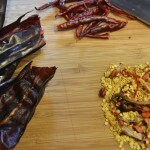 This recipe is heavy on the chilies de arbol, causing a much redder color than the enjococado I’m used to. It also makes it quite a bit spicier than I’d like. One of the things I remember from visiting Fiesta Del Mar was its use of sliced almonds as a decoration on top. This recipe used no almonds at all. Either way, I recommend you give this recipe a try. The flavor was good, albeit not quite what I was looking for. Season the chicken generously with salt. In a large skillet or Dutch oven, add oil and heat to medium heat. 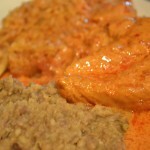 Brown chicken pieces until they are about half cooked (in batches if needed). When chicken is cooked completely, remove from skillet and set aside. 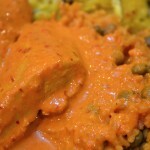 While chicken is browning, place tomatillos and tomatoes in a medium saucepan, cover with water, and bring to a boil. 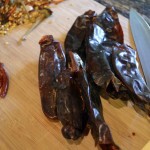 Once done, remove from heat add chiles and cover until chiles are rehydrated and soft. 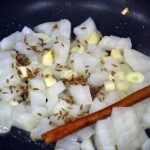 Place cumin seed, onion, garlic, cinnamon strip, and oil in a small skillet and gently fry on medium heat for 3-5 minutes to release and combine flavors. 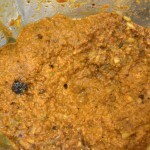 While reserving liquid, drain tomatillos, tomatoes, and chiles and place in blender jar. Add about 1 cup of reserved liquid to the blender jar. Blend well until sauce is very smooth. While chicken skillet is still hot, pour in sauce and stir to release brown chicken bits at the bottom of the pan. 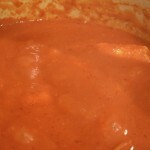 Replace chicken in sauce, reduce to medium-low heat, and cover. 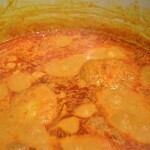 Allow to simmer for about 15 minutes, or until chicken is done. 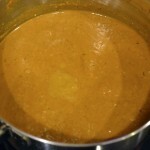 If sauce because too thick, add water or chicken broth in small amounts. Add Mexican cream and stir to combine. Simmer for 10 minutes to combine flavors and warm cream. I’m not sure there’s a better way to start this blog than trying to find a delicious recipe that seems elusive to almost everyone. The Internet seems to disagree, so I spent about four weeks making all the variations of this recipe I can find. 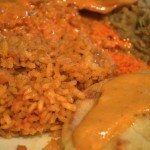 Anyone who’s been to La Fiesta in Mountain View, California has had an opportunity to try what’s been called “Grandma’s Special” both in enchilada and regular, sauce-over-chicken form. 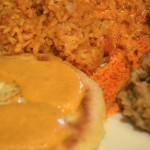 While La Fiesta and its family of restaurants – La Fiesta Too and Fiesta Del Mar, which call it “Great Grandma’s Special” – have become fairly well known for this recipe, many people don’t know what it actually is or how to make it. Myself included. The sauce these restaurants use is called “enjococado” by Mexicans in the know, which directly means it’s a sauce made with “jocoque”. You won’t find jocoque easily in most places, but Mexican cream substitutes well, and keeps the flavor close. Unfortunately, finding a comparable enjococado recipe has been hard. So far, I’ve found three that purport to be the correct recipe and I’ve tried them all, doing a taste test after the fact. I’m providing all the relevant recipes below as well as my experiences with them, but I recommend you start at the bottom and work your way up because I think the last recipe is the closest you’ll get.